The housekeeping and maintenance of these trailers is the responsibility of the owner and not Muskoka Bible Centre. 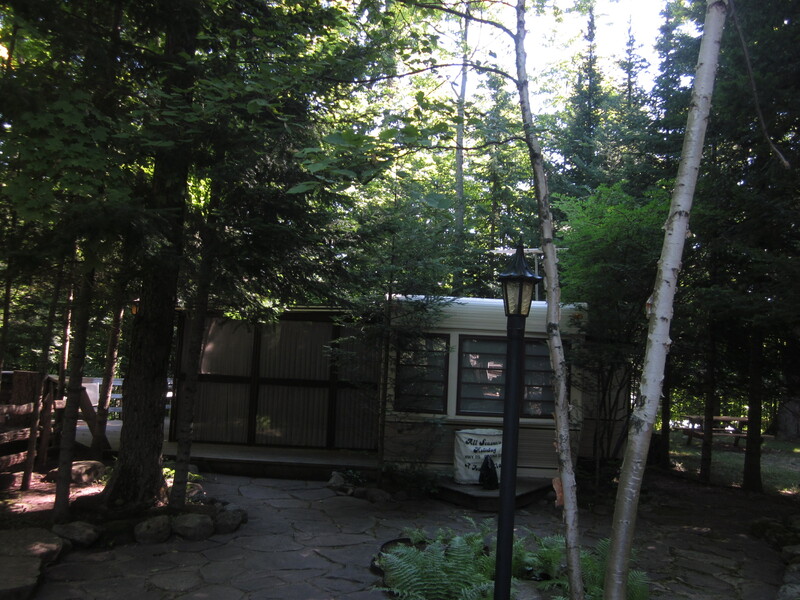 All renters must check in at the Campground Office upon arrival. 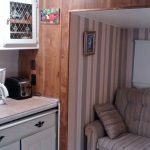 The trailer is 33 feet long, is 10 years old, has a large deck, one bedroom with a queen bed, bathroom with shower, open concept living, dining room and kitchen, air conditioning and a futon and a sofa bed. It sleeps 4-5. Price is $675 for the week. The trailer is only available after August 26, 2018. Contact – John DaPonte papajohn_33@hotmail.com or 519-871-9263. 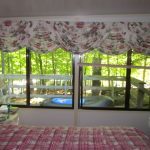 1997 35’ Park Model with Florida Room and Covered Deck- Sleeps 7 (1 Queen, 1 Queen pull-out, 1 Twin bunk with trundle) – Full Bathroom & full Kitchen – Deck with a Patio Set – Fire-Pit with seating & BBQ – A/C – 2 TV’s with DVD player, electric Fireplace. Perfect family retreat available to rent July 6-13, August 10-17. $700 per week sat to sat. 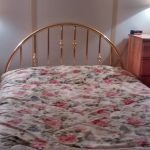 Also available outside of July and August for $450 per week sat to sat. Or $100 per night. Email pinner_v@hotmail.com or text 9056904753 for inquires. Weekly Saturday to Saturday rentals only. We have a trailer for rent at MBC. We want to share Grierson’s Get Away with you! Lot # S3. 27’ Jayco Jayflight , 1 tip out in kitchen, fully equipped, small bathroom w/shower, sleeps up to 8 people, 2 double bunks, Queen bed, table and couch go into beds, A/C, deck, awning, BBQ, fire pit, lawn chairs, deck, bring own bedding and towels, wrist bands for park activities and sand beach, golf car available for extra fee, parking for 1 car. Quiet location, great neighbours. 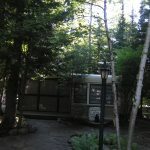 Visit www.muskokabible.com for program details and park rules. Available June: 1-8, 8-15, 15-22 ($750), July 13-20, ($850) golf car ($200) for week. Contact: Ruth Grierson. 905-870-6212. rgrierson421@gmail.com Pictures to come upon request. Sleeps 7: master bedroom with queen size bed, two single beds in the kid’s room and two pullouts in the living and Florida rooms. 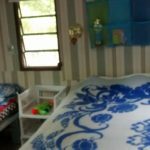 Bright bedroom with large window, customized kid’s room. The lot is surrounded with beautiful mature trees which create naturally cooled and shaded area. Large deck and large private backyard with hammock, perfect place to relax and enjoy. Fire pit with patio chairs and table. Parking for 3-4 cars. 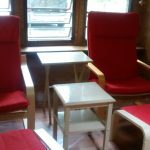 Includes: Deck BBQ, water cooler, two fridges, stereo, DVD player, appliances, cutlery, plates, complementary tea and coffee, etc. Check in Saturday around 3 pm. Check out Saturday by noon. Price $680 per week during the season (July & August) and $80 per night off season. For more information please email Christoff at christoffc@rogers.com or call/text at (905) 273-7595. 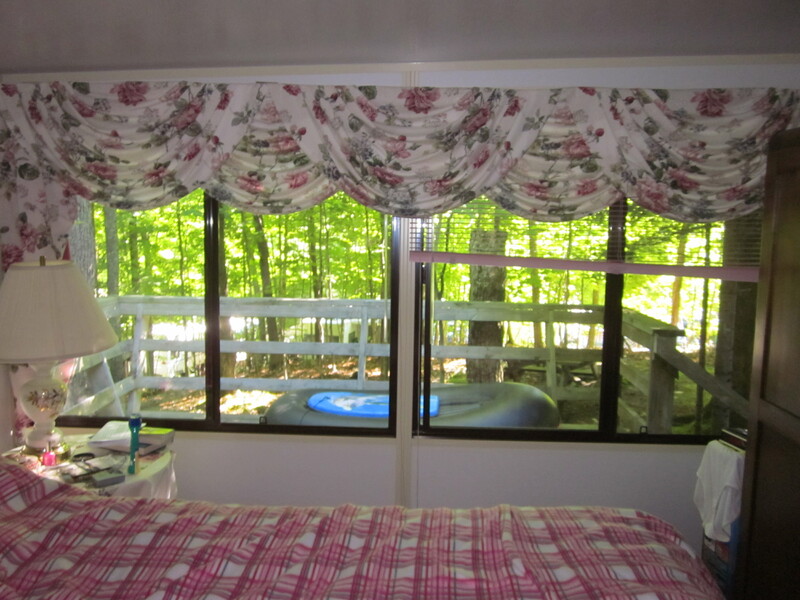 Available to rent for $975 weekly is this clean and spacious 2 bedroom trailer (12’ x 40’), sleeps up to 7 people. The master bedroom has a queen bed with lots of storage. Bedroom 2 has a bunk bed with a double on the bottom. 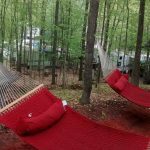 Other features include a pullout living room sofa, full kitchen, full bathroom, A/C, BBQ, fire pit, deck and 6 person patio set. Free Wifi available at the Nibble Nook and The Hub. *Bunkie (sleeps 4) available for extra fee. -family room in basement with TV/DVD player. -full kitchen: fridge, stove, pots, dishes, utensils, toaster, microwave, etc. included. Two-story three-bedroom Cottage- one of the bedrooms on the main floor. 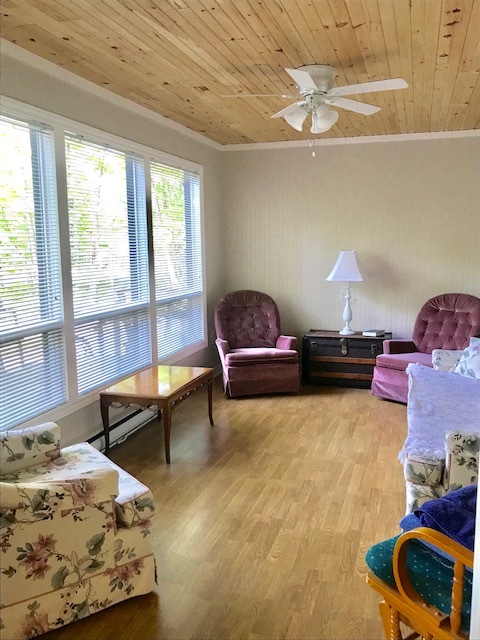 One and a half bath, living room, dining room, kitchen, private dock. Very quiet private location on the water. On Widjiitiwin Road; a short walk to MBC. 3 Queen beds, Double Futon in Living Room. 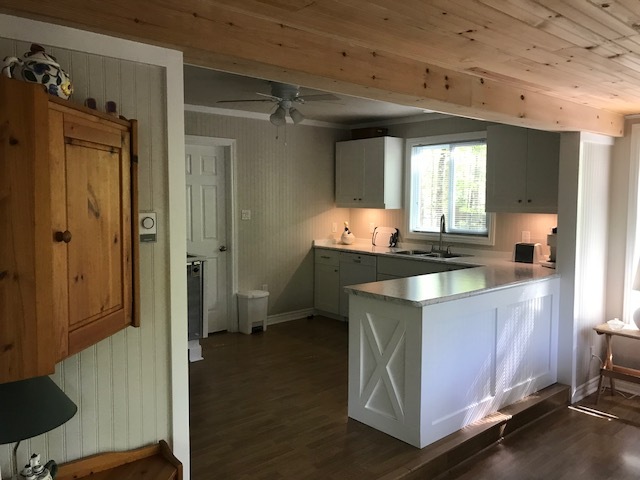 Screened dining porch attached to kitchen. 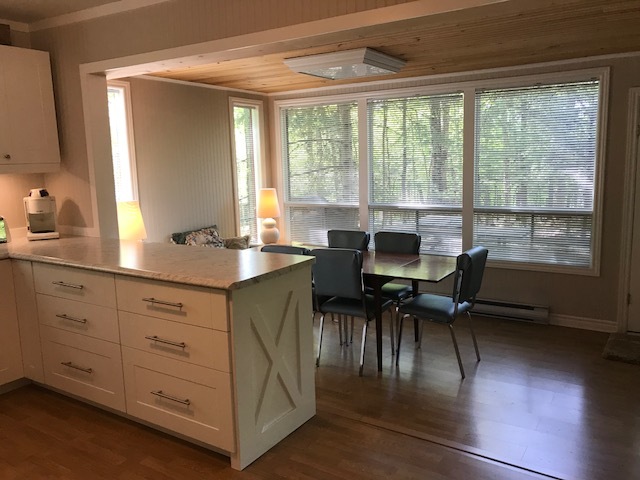 Dining area in cottage. Mix of shade trees and grass backyard with campfire pit. Bring own sheets, pillow slips and towels. 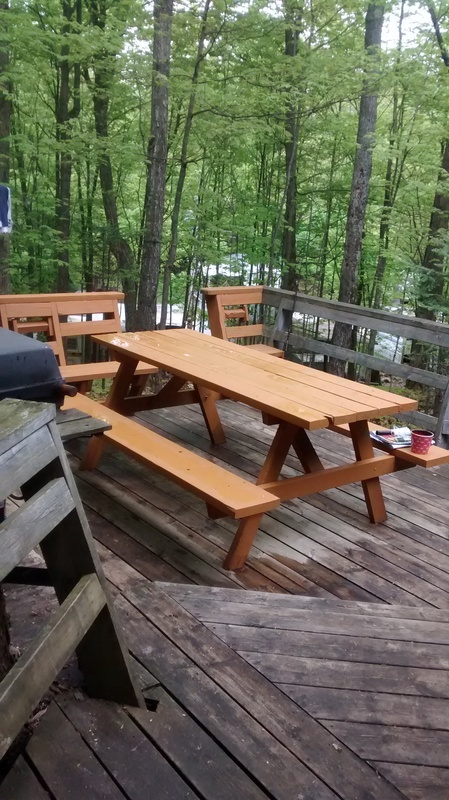 Available Saturday at 4:00 p.m. to Saturday at 10:00 a.m.
Rental- $1050./week; $2000. for 2 consecutive weeks; $2900. For 3 consecutive weeks. $200.oo deposit to confirm reservation. 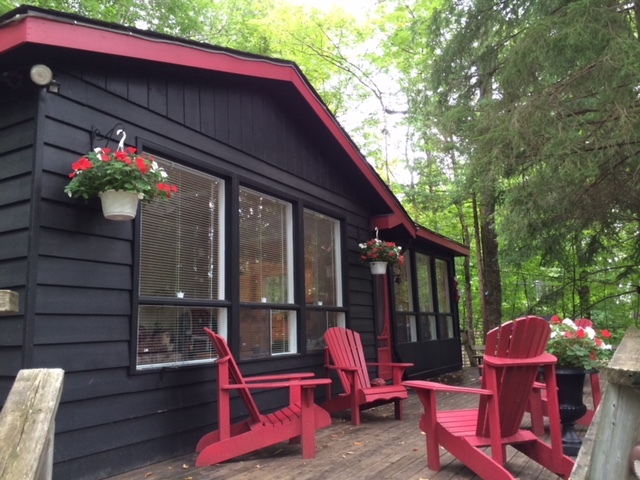 This newly renovated, very private cottage boasts 3 bedrooms and 2 baths on two levels. Maximum occupancy is (8). 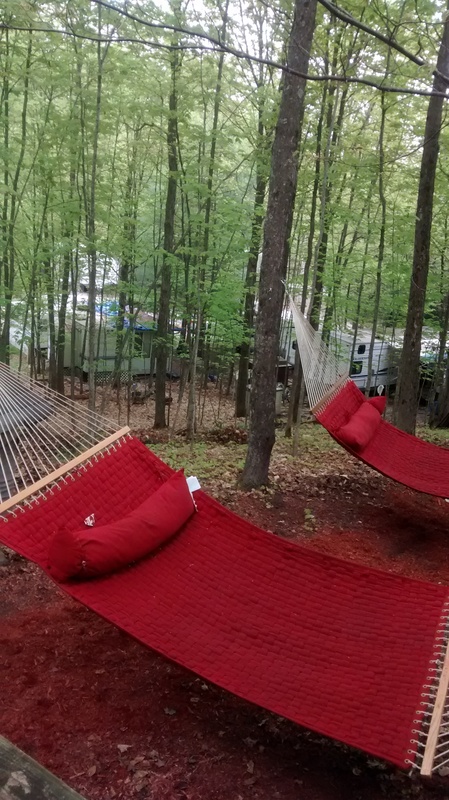 No additional sleeping bags, blow-up mattresses or other allowed to increase occupancy. – Furnace, air condition, automatic back-up generator. – Linens, towels, beach towels, dishes, glasses, cutlery, pots and pans. – Main level has queen bedroom, second bedroom has 2 twin beds, 4 piece bath, dining room, living room with tv. dvd player and electric fireplace. 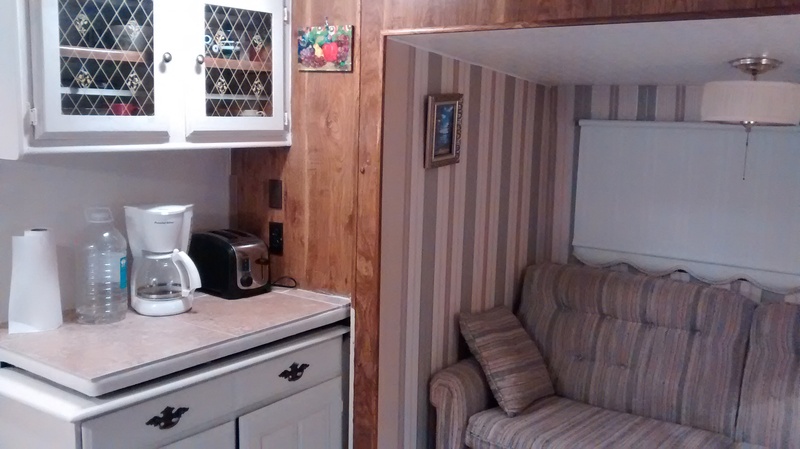 Full kitchen with fridge, stove, oven, dishwasher, microwave, toaster, coffee maker, electric kettle and blender. 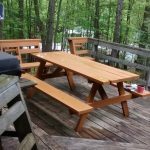 – Front deck has bbq and glass table with 4 chairs. – lower level has queen bedroom, 3 piece bath, family room with tv. dvd. 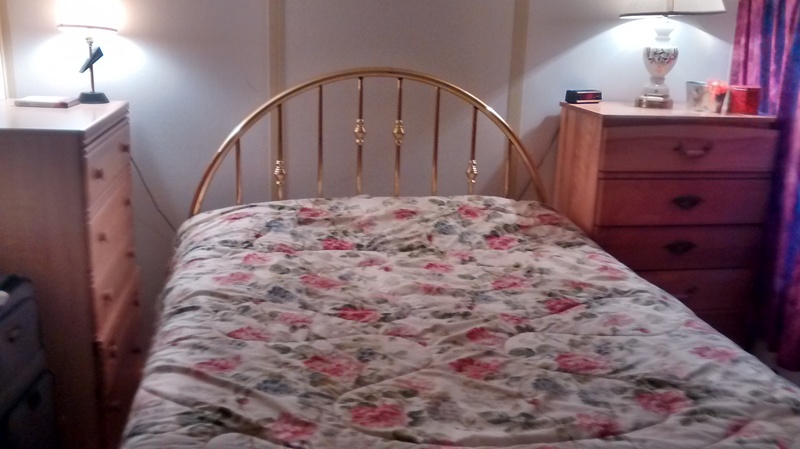 player, pull-out queen bed chesterfield, walk-out to back deck with gazebo with large table and chairs and fire-pit. Laundry room with washer and dryer. – Short walk to neighbourhood child friendly public beach. – Although a 2 minute car ride away on the next road all amenities of M.B.C. are included. BECAUSE OF ALLERGIES THIS IS AN ANIMAL FREE VILLA. Rent is $ 1300.00 per week for a family of 5 or $ 1500.00 per week up to 8 persons max. ( June – September) Saturday arrival 3p.m. with following Saturday departure of 10 a.m. These prices include taxes and cleaning. For new customers there is a damage deposit of $ 300 which will be refunded if not needed upon departure. For all other pricing please contact. The perfect cottage for two families to share or for a family and their extended family. 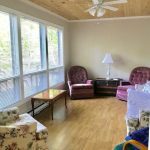 Huge 5 Bedroom cottage right on Mary Lake with spectacular views of the sun set and walking distance from MBC. Maximum capacity is 10. 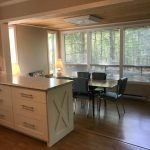 Cottage has 5 large bedrooms, 3 full bathrooms, 3 decks, BBQ, great well water, washer & dryer, satellite TV, DVD, huge kitchen & family room, dishwasher, second family room in walk out basement with a fireplace, 3 season Muskoka room for dining, and more. 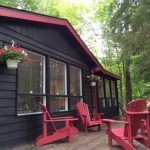 Please note we are already fully booked for the summer of 2019 but have availability for this spring or fall. November 1 – April 30: $150 (nightly) / $1,000 (weekly, Sat 3pm – Sat 10am). May 1 – June 30: $250 (nightly) / $1,500 (weekly, Sat 3pm – Sat 10am). July 1 – August 31: $325 (nightly) / $2,100 (weekly, Sat 3pm – Sat 10am, space to dock your boat). September 1 – October 31: $250 (nightly) / $1,500 (weekly, Sat 3pm – Sat 10am). 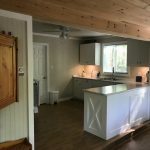 Rustic two-bedroom, one bath cottage on Mary Lake. Propane fireplace keeps it cosy in the winter months. 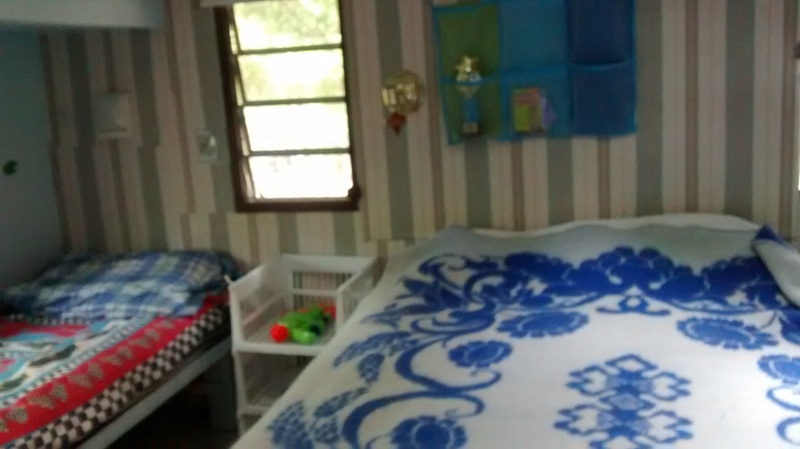 First bedroom has kingsize bed; second has two twin beds. Daybed in living room. 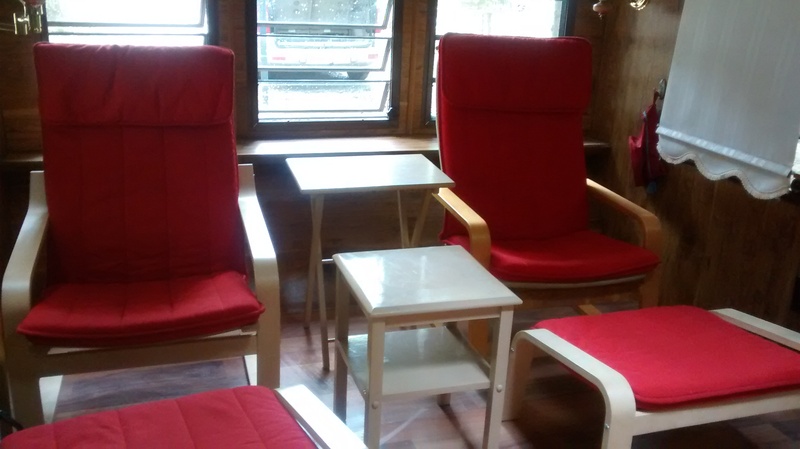 Bunkie available May to October (not insulated) with two twin beds. Beautiful view of the sunset over the lake. 15 minutes from the town of Huntsville. Close to Muskoka Bible Centre. May to October there is clean running water safe for drinking. November to April there is no running water – water is provided for flushing but you need to bring your own drinking water.